Beachfront at Kana'I a Nalu - VRBO PRICES from $139/nt ! FREE PRIVATE WIFI! Lower VRBO Internet Pricing. WE NOW ACCEPT PAYPAL! The Maalaea Harbor with its stores, kid park, and the Maui Aquarium as well as the various tourist boats are about 1/3 mile away by the highway-a long walk or a short drive. 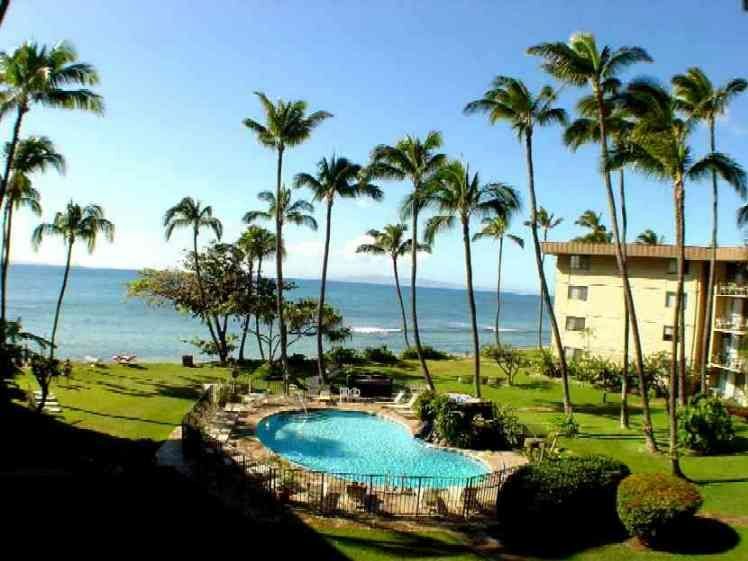 Our Condo on Ma'alaea Bay is a beautifully furnished and decorated 2 bedroom, 2 bath unit. Major Remodel done (2007), constant upgrades including 52' LCDTV, New Master BR Furniture, Gourmet Kitchen complete with Granite Counters, Cherry Wood Cabinets, and Designer Appliances. Air Conditioning, Premium Tile in Living Area and total remodeling of both baths (includes adding Jaccuzzi tub). Also added 32' LCD in Master BR, 27' LCD in BR2, new super quiet Washer Dryer. Plantation Shutters in BRs, pull down shades in Living Area, Free High Speed Wireless Internet. Parking directly adjacent. We have just replaced a new dishwasher and the master bedroom new mattress. Convenient ground level, with a great ocean views from the living and master bedrooms. Comfortably sleeps up to 6. Air conditioning, free PRIVATE WiFi and free long distance USA/INTERNATIONAL. Master bedroom- queen bed, 32' TV, DVD, and desk with phone and PRIVATE WIFI , printer. 2nd bedroom- twin beds (can use kit to form a king, 27' TV, DVD, phone). Living room- queen sized fold out couch for extra guests. Walking distance to Ma'alaea Harbor with its great Maui Ocean Center aquarium, miniature golf and bumper boat park, restaurants and shops. Whale watching and snorkeling trips depart from here. 4 Golf courses within 5 miles - including Sandalwood, Waikapu, Maui Lani, and Elleair (Silversword), with the world-famous Wailea and Makena courses only a few miles south. Ka'anapali is only 20 minutes north. We are proud of our condo and would love to have you share our piece of paradise. Keywords: Condominium, 2 BR, Ground floor, Wheelchair Accessible. We bought another condo in Maalaea originally in 1981 but sold it when our kids were in college. When we could afford it again we shopped all over the island but returned to peaceful Maalaea. . The beautiful quiet beach, peaceful location, and cooling breezes called us back. Since we planned on staying there ourselves a lot, we did some serious upgrading to the place; a flat screen TV in every room and a modern kitchen were a must. We opened up the kitchen so you could see the ocean from there,modernized with cherry wood and granite and installed a whisper quiet Bosch dishwasher as well as a modern quiet washer and drier since we don't want to be disturbed. We love it there and we are sure you will too. Check out our guest book when you visit and leave us your comments We have also installed a new system that provides free WiFi (with our private security code) and FREE worldwide Long Distance from our in condo phones!